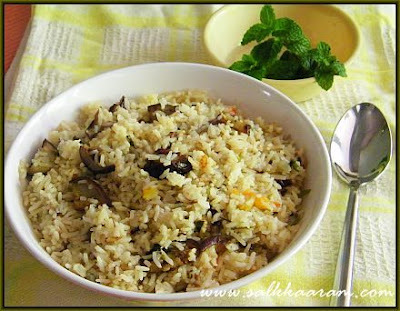 Turkish Eggplant Pilaf / Patlicanli Pilav | Simple and Delicious ! Eggplant / aubergine has an important role in Turkish Cusine. You can find various Turkish dishes prepared with eggplants. 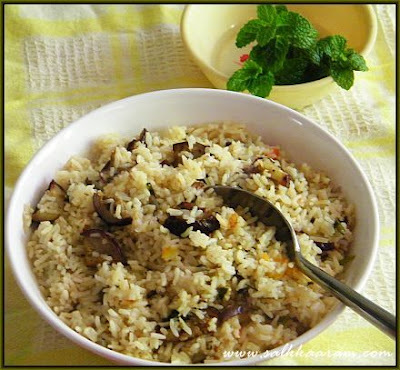 This one is similar to the brinjal rice recipe from Middle Eastern Cuisine, that I had posted long back. Chop eggplants and soak in salt water for 1/2 hour. Squeeze the eggplants, and keep aside. Heat 2 Tbsp olive oil, and fry the eggplants until slightly brown. Add remaining oil to the pan, saute chopped onion. When semitransparent, saute chopped tomato, mint and coriander leaves. Add hot water, enough salt, cinnamon stick, pepper powder, rice and allow to boil. Put fried eggplants, and cover the pan, reduce heat. Cook on a low flame until the rice is cooked. You can keep half of the eggplants and add it before serving pilaf. I cooked rice in the pressure cooker until 2 whistles come. Cooking time may vary depending the quality of the rice. Looks yummy and perfect. Very new to me. That is a good one! first time on your blog - I also always wish that someone would try out a recipe of mine and give me some feedback ---- perhaps one day! You have some good ones here, dear! this recipe is new to me and looks yummy.